As we start laying down our first barrels of whisky, we have had to make some tough decisions. Though our choice of grain, yeast and water along with our mashing, fermentation and distilling techniques will influence the quality of the final product, it is thought that up to 80% of the character of a whisky comes from the oak cask in which it is matured. There are lots of options for our casks, and we have to make some choices. This is actually quite hard since we won't know whether or not we made the right decisions for several years. By law, we have to mature our whisky in wood for a minimum of three years. (This is a Canadian law. Other countries may have different regulations. For example, Bourbon Whiskey only needs to be matured for two years according to U.S. law.) This gives us a great deal of leeway. We are free to age our whisky for more than three years. We desire a quality product, and aging longer may be necessary to obtain a whisky we are happy with. On the other hand, the longer it sits, the longer we have to wait before we can sell it and the cost of carrying maturing whisky without sales is a consideration, especially for a craft distiller with limited resources. It is also possible that it can sit in the barrel too long, imparting characteristics to the whisky that are undesirable. Oak casks are used around the world for maturing of whisky. American law dictates that Bourbon Whiskey must be matured in new oak. This creates a large market for used bourbon barrels and most Canadian Whisky and Scotch Whisky is, therefore, matured in ex-Bourbon barrels. It has become common to see whiskies aged or "finished" (i.e. matured for a short period of time at the end of the aging period) in other types of used barrels, such as sherry or rum casks. We are under no obligation to use ex-Bourbon barrels. We have decided to try a combination of ex-Bourbon barrels, new oak barrels and even other oak barrels previously used for other types of alcohol. However, even that decision brings choices. The species of oak plays a role given the variations in cell structure. American oak is the most common, but there is growing interest in Canadian oak, currently being used by some Canadian wineries. Size standards also vary and the size of the cask plays a role given the varying surface to volume ratios. Many distilleries are now experimenting with maturing or finishing their whiskies in smaller barrels to simulate longer aging. We will likely try this as well. The conditions under which the maturing cask is kept influence the aging process. Evaporation from the porous wood always occurs. This is known as the angel's share. Scotch Whisky experiences about 2% loss a year. It is known, however, that whisky maturing in other parts of the world have a much higher rate of evaporation. Factors like the original strength of the spirit, altitude, temperature, humidity, and air flow all play a role. We are very concerned that we don't have excessive loss to the angel's, since we will have less product to bottle in the future and, therefore, at a higher cost. There is a great deal of research into the whisky maturing process. It is known that there are chemical changes that occur to the whisky in wood due to two different processes. Additive activity introduces new aroma and flavour compounds to the whisky, coming from cask-derived congeners (chemical constituents). Barrels are charred before use, and this creates a high level of colour and extractives in the wood. Aroma compounds such as lactone (coconut) and eugenol (spice and clove) and, for refill barrels, elements from the previous contents, get added. Subtractive activity, on the other hand, involves chemical reactions that take place that remove or alter constituents in the whisky. This activity includes evaporation and absorption. The charred surface of the cask also causes chemical degradation reactions such as oxidation. Despite the known scientific knowledge on whisky maturing, the process is still largely a mystery. Experienced distillers can try to control and predict the process. Ultimately, however, the colour, aroma, and taste of the final product is somewhat of a gamble. We are trying a few different permutations of wood type, new and used barrels of different origins, and cask size. We anxiously wait for the first three years to pass so that we can see the results and determine if more time is necessary. There is risk. What if the final product is not good? We cannot role back the clock and start again. We keep our fingers crossed that most of our (educated) guesses will pay off and we will have some unique and exceptional whiskies in a few years time. 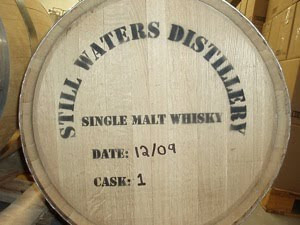 Last November I filled one of your Whisky Works Solo barrels with a bottle of Still Waters Single Malt Vodka and aged it for two months. I've now turned it into a living cask...what fun!